Trim and Spin People who are recovering from injuries this is great because you don’t want to hurt yourself to begin with. This is perfect. Want to reduce your health-care costs? Get moving! 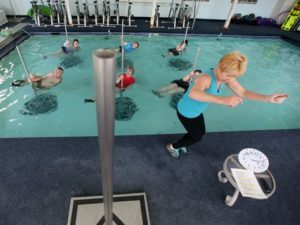 I’m telling you about my aquatic classes because I know that for some of you, exercise can be hard on your joints. It is for me, in part because I have arthritis. But I’ve found that I can do more and push myself harder in the water. Seniors strip down for pool fitness on the pole Popular throughout Europe, the steel poles allow for more than 150 different exercises, working the shoulders, abdominals, legs and buttocks. Side benefits include improved posture, flexibility and coordination, and physical therapy for arthritis or sports injuries.